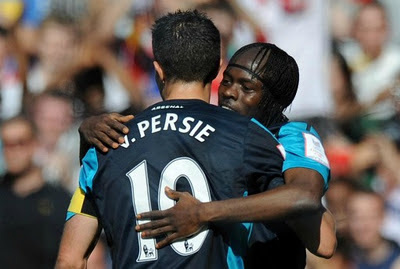 Ashburton Grove - Arsenal news and Arsenal opinion: Gervinho's RVP wish -Wenger tracks TWO full-backs -Times up for Diaby? Gervinho's RVP wish -Wenger tracks TWO full-backs -Times up for Diaby? It's hard not to be sentimental about Monday night's game. It was the return of one of the club's greatest ever players and he put the icing on the cake by scoring and winning us the game. Our King is back but looking towards the future, Henry is only with us for six weeks and whilst I'm sure he'll provide further contributions we have to remember that he is part of Arsenal's past and the manager needs to be looking towards the club's future. Henry is a very short term option for us. His signing is great for the time being but will only provide us cover for the length of the Africa Cup of Nations. I'm sure I can't be alone in believing what Monday night proved was that our squad isn't strong enough. It needs reinforcements, even if that means we have to sell a few players to make space for them in our Premier League squad. While we might be happy with Henry's return - the last time I was celebrating an Arsenal goal like that was when Arshavin scored against Barcelona - I can't help but think we mustn't take our eye off the ball and remember we've got a huge fight to secure fourth place this season. I thought Arshavin had a particularly good game on Monday. It was telling that he stayed on the pitch for the whole 90 minutes - I can't remember when that last happened. I just hope that the Russian will continue to work hard, even if things aren't coming off for him. At least he was trying. With Gervinho away, we need Arshavin to step up and if Monday night's shift is what we can start expecting, he should play an important role in helping us achieve our aims. Speaking of Gervinho, he has pleaded with Robin van Persie to sign a new contract. "I don't want the sale of Robin van Persie. Arsenal is a team that needs good footballers and leaders on the field. "Robin is a player who pushes companions to work harder and give more effort during matches. He is a dream to play with. "Van Persie is the captain and the boss in the group, without doubt. I saw that from my first day at the club. "For me, when opponents see Robin on the other side, it is a huge psychological blow. I am always happy playing with him." After getting back from meeting Maradona in Dubai, let's hope the Dutchman comes back to the club with more fire in his belly. We need him to start firing on all cylinders again. Hopefully with the 2011 calendar year goal scoring record off his back, he'll return to business as usual at Swansea on Sunday by banging a few in. You would have thought at some stage we will see Robin play alongside Henry. And the feeling amongst the players is that the Frenchman is giving everything in training to prove that he can still do it. Laurent Koscielny says his compatriot is training like a 20-year-old and Ignasi Miquel says the players have been given a big boost by Henry's return. I just hope that the lift created by Henry's signing can be beneficial to us on the pitch - perhaps in the same way Arshavin's was when he signed for the club. Miquel has been speaking of getting used to playing in the left back position and I have to say I was impressed with his involvement on Monday night. He seemed to offer us more in that role going forward than we've seen from other players who have been played there since we lost Santos and Gibbs to injury. You might have expected him to have been loaned out to gain experience this season and that's what he was expecting prior to the disappearance of every first choice full back. "If they sign someone or Kieran Gibbs comes back, we’ll see if I stay here or go on loan." I wouldn't be surprised if he still did go on loan, but it won't be until the end of January that anything is sorted. All going well we should have Thomas Vermaelen and Bacary Sagna back for the Manchester United game and if that happened I could imagine that the manager would look at his options again. It would be good for the Spaniard to get a run of games under his belt and perhaps a spell in the Championship would do him good. I'm sure he would learn from the experience and it should toughen him up. It appears the manager is still looking for cover at left back with us being linked with Lyon defender Aly Cissokho - although the French club don't want to loan him and would rather sell. The other name in the frame is Southampton's Luke Shaw but at 16-years-old, you can't imagine the manager would throw him straight into first team action. If we've learnt anything from which players the manager has picked this season it's that he's preferred experience over youth. That's probably why we haven't seen much of Alex Oxlade Chamberlain - who has denied a Daily Star story that he'd like to leave the club on loan. Congratulations to Francis Coquelin who has been rewarded for his fine start since his promotion to the first team squad with a contract extension. And it appears that my question over who Thierry Henry will replace in Arsenal's Premier League squad has been answered with the news that Abou Diaby is heading to Qatar for more treatment on his troublesome ankle. The club haven't said who Wenger will remove from the list of 17 "non homegrown" players to make room for Henry, but my guess is it will be Diaby who is axed. No doubt we'll discover exactly what's happening when the manager faces the media tomorrow.